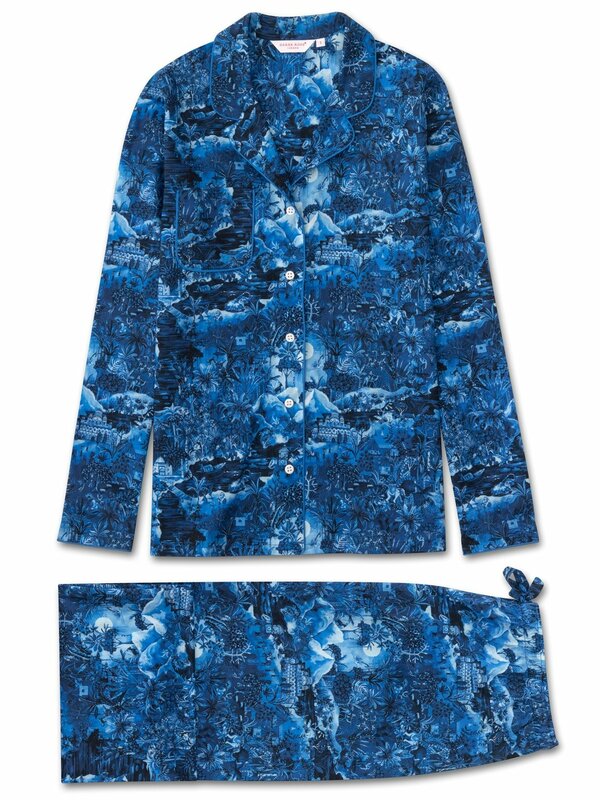 The detailed Ledbury 10 women's pyjama set is adorned with our signature hand-painted print of the season which takes you on a voyage through the waterways and rice paddies of Kerala, India. The riverbanks are bursting with wildlife and nature, with this dream-like scene also including elements of other areas of India, from the elephant polo of Jaipur to the grand palaces of Rajasthan. You may even spot an appearance from Derek in his Regimental pyjamas! Made from our signature cotton batiste, the Ledbury 10 jacket features a fully piped finish in a light blue trim, a single patch pocket and mother of pearl buttons. The quality of craftsmanship continues with the trousers and their elasticated waist with self fabric drawstrings for added comfort.